USAePay support works similar to the other payment gateways. It supports saving of cards for future use. Credit card payments are now supported and ACH will be implemented soon. 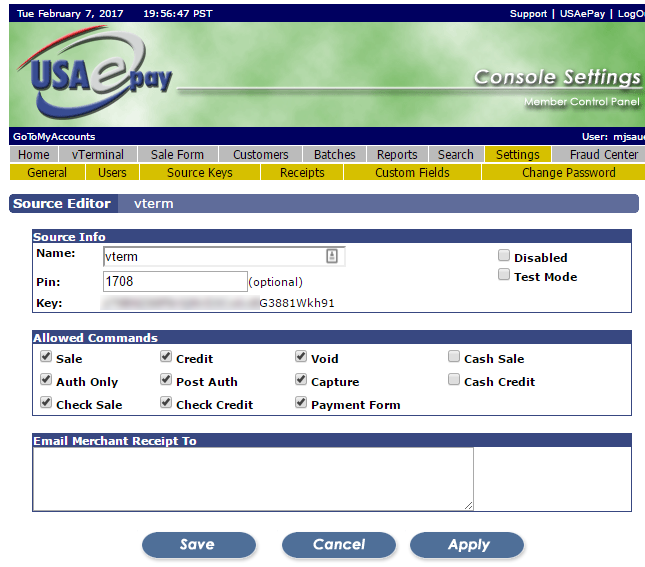 Login to your USAePay console. Select Settings. You will see an option for "Source Keys"
You will see your Source Keys listed. You can have multiple Source Keys. For example, you can have one for test and one for production. Click "edit" on your desired Source Key. You need to be sure to set a PIN in order to use the key with the API. 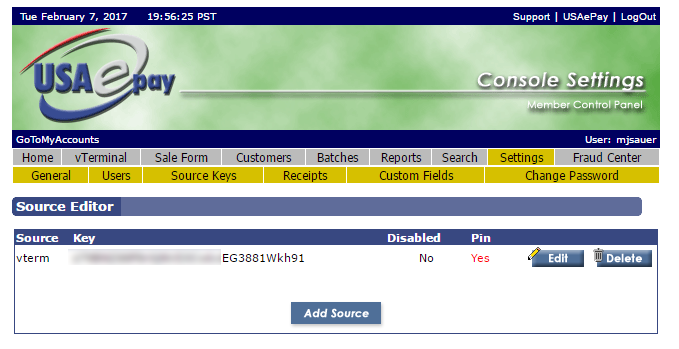 You will need to copy the Source Key and the PIN for setup in your portal. It is advisable to create a Source Key for both test and production. The portal payment method settings allow you to setup both a test and production key. You will see in the image above that each Source Key has a checkbox for "test mode". On your test Source Key, make sure you have that checked. On your production Source Key, leave the box unchecked. Note: You can use only one key, but you will have to always control whether you are in test mode from this screen and not within your portal settings. So having the two keys is more convenient. Now go to your portal and click Settings, and then Payment Methods. You want to first enable USAePay. After doing that, you will have a link available for editing the settings. Click the edit settings link. Select which cards you are accepting as well as which QuickBooks accounts you are using for initially holding pending funds. This is typically something like "Undeposited Funds". The QuickBooks Payment Method can be whatever you like, but most often this is set to something like "Credit Card". It is advisable to set you Payment Method label to something other than the default "USAePay". If this is a credit card payment method, just choose something that will make more sense to a user like "Credit Card". The label has no effect on how the payment is recorded. If you created both a production AND test Source Key, you will populate both sets of Authentication fields. If you only created one key, then set that key and PIN in the first two field and leave the test fields blank. If you chose not to create a separate test Source Key and PIN, then you must control whether you are in "test mode" from your USAePay console. During testing, you can enable the payment method only for a staff user. Once you are ready to use in production, you can enable for all users. This payment method also supports setting up Transaction fees or "convenience fees". Check with your bank or payment gateway regarding rules for implementing these kinds of fees.